You’ve been wrongly convicted and tossed in the slammer or maybe rightly convicted. It doesn’t actually matter. The point is, you need to break out of this place. In Jail Break you will attempt to evade guards and other inmates as you plan your escape. 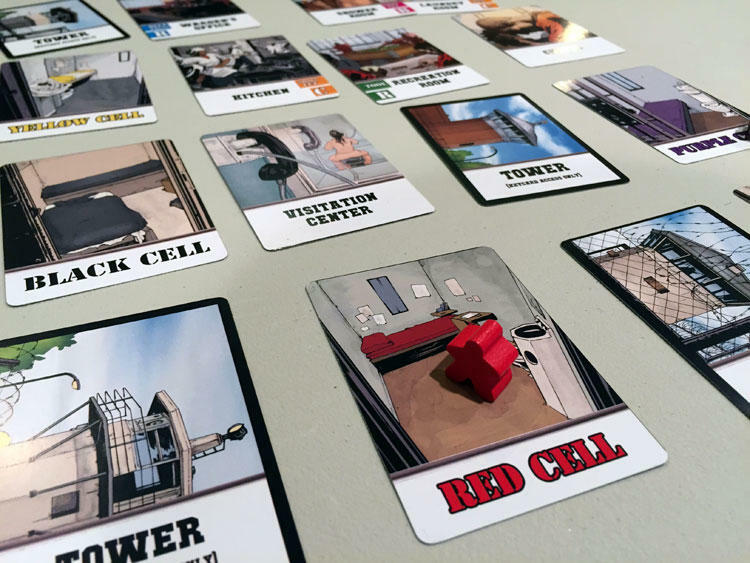 In Jail Break, 2-6 players will attempt to navigate the jail to gather the resources they need to escape. Jail Break is an action selection game that plays in about 20-40 minutes. Jail Break is played on a randomly setup, modular board. Consisting of 24 cards, the jail can be laid out in a 6×4 grid, or really into any shape the players would like. Changing the configuration of the jail can lead to a different experience in each game. Players will each have a mugshot card that shows their special ability. During the game, players will be able to move throughout the prison, gathering resources and potentially attacking other players. Each turn a card will trigger a random event that could be positive or negative, and at the end of the turn, a guard will be moved to a new location of the player’s choice. The first player to successfully escape is the winner. Each player gets an inmate card with a special ability. After the jail is laid out, the inmate pawns are placed in their appropriate cells. 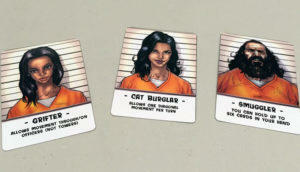 At the beginning of each player’s turn, they will draw a Jail Break card that can help or hinder their plans to escape. They may find themselves in a fight and sent to the infirmary or they may find a weapon or an item that can be used to bribe a guard later. Each turn an inmate may perform three actions. First, the inmate can move one space orthogonally into a new room. If you are in a room that can provide a resource, you may spend an action to gain that resource. Similarly, if you are in a room with another player, you can spend an action to attack them. And if you have gathered all the resources and you are in the room you have the blueprint card for, then you can spend an action to attempt to escape. Combat is handled by opposing die rolls. 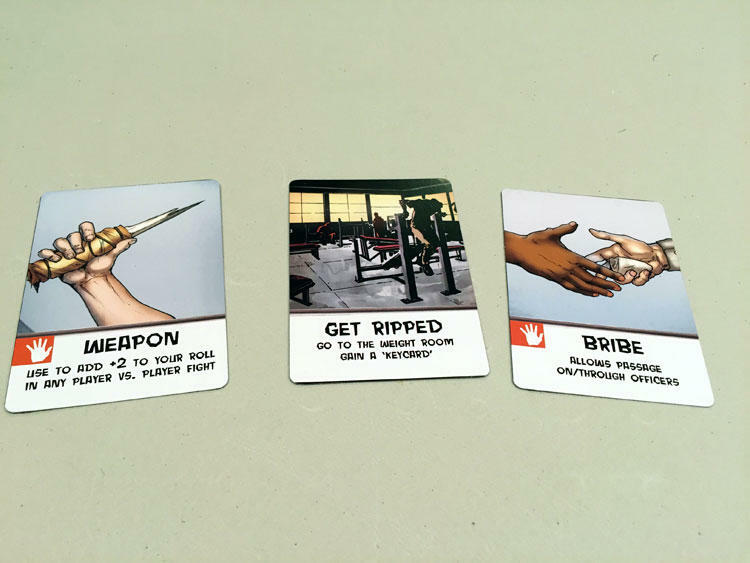 Players can play a weapon card from their hand before the rolls to gain the specific bonus. The loser will head to the infirmary, with the attacker stealing a card if they won. Some rooms have shortcuts to other rooms and can be used to quickly move between rooms that aren’t necessarily adjacent. 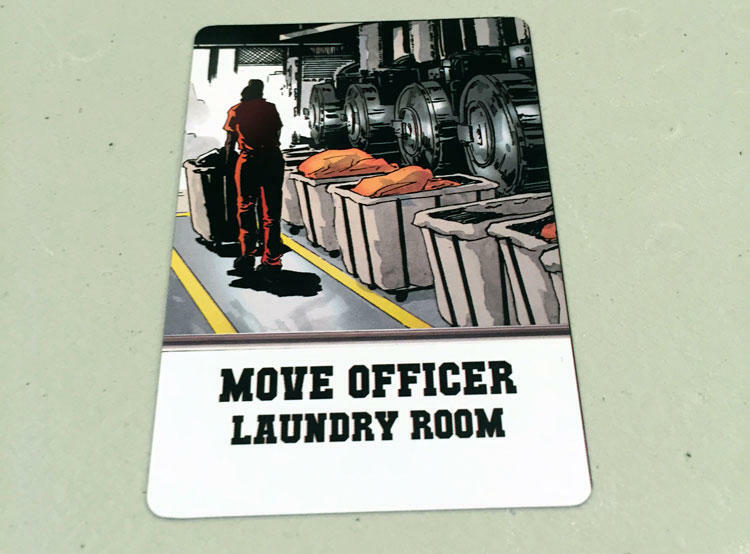 An officer card is drawn at the end of the turn and, in most cases, the player can choose a guard to move to the room on the card. Some officer cards actually provide bonuses or other events. If a guard enters a room with an inmate, that inmate is immediately sent to solitary. All resources and escapes require a die roll to be successful. Each player has a six-sided die and must roll 4-6 to be successful. The first player to gain the three resources (tool, keycard, and blueprint) and escape wins the game. The prison layout is modular, so each game will play a little differently. There is a lot to like in Jail Break. The modular board made from the room cards is definitely my favorite part. It feels like a mini-game of Prison Architect. Rather than a boring 6×4 grid you can create an “L” shaped layout or something with a small corridor between two sides where players get cut off easily. It allows the game to feel quite a bit different when the layout is changed. Players will want to avoid the guards, or else they’ll end up in solitary. This is extremely important because moving around the board is a strategic aspect of the gameplay. The event cards and shortcuts allow a little bit of tactical planning, but you will spend most of your actions jumping from card to card. The game can also be plenty mean. You can attack other players, move guards into their way, or even use events to mess up their plans. There is little recourse for a player who has a guard dropped into the room they were already occupying. Then back to solitary for them. If you are a fan of “take that” types of games, then Jail Break might be right up your alley. Since luck is going to be a big factor in the game, it’s nice that the game plays quick enough (especially at the lower player counts), that the luck element really isn’t too concerning. It’s not a heavy strategy game by any means, and I was surprised by how light the game really is. Sometimes it’s just fun to see how difficult to escape prison you can devise with the 24 room cards. 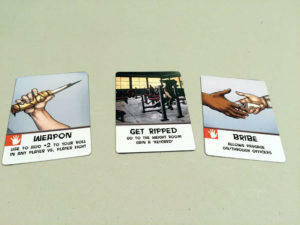 Players will find resource cards to help them with prison fights and also escaping. 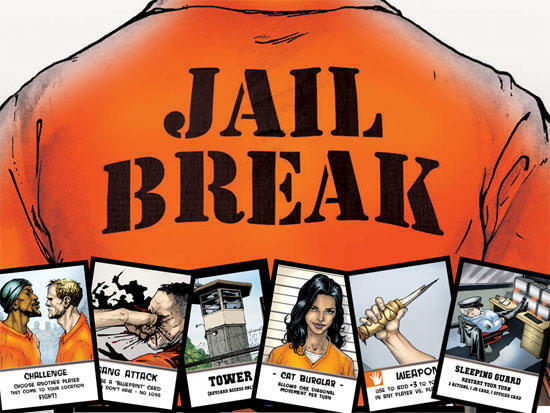 Jail Break’s theme comes through strong as players attempt to evade guards and other prisoners in an attempt to escape. The modal layout of the jail means no two games feel the same. Attempting to stay clear of the guards adds quite a bit of tension to the game, as a poorly timed capture can really set you back in your attempted escape. The game does feel procedural at times. There is a lot of moving and rolling a die while attempting to basically scratch everything off your shopping list. And the luck of the Jail Break and Officer cards have a large impact on the game. It works best at the lower player counts, as with 5-6 the jail is overcrowded and it’s hard to make much progress. 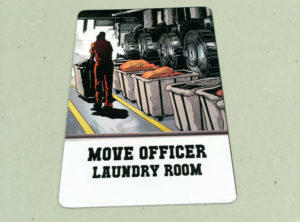 If you are looking for a light card game that can also be played quickly, then Jail Break is worth checking out. The easy to learn rules means you can get it to the table quickly and I had a lot of fun creating interesting layouts with the room cards. 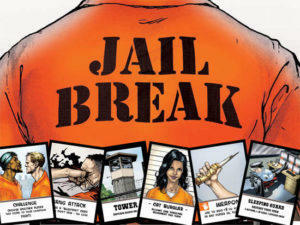 Jail Break will also appeal to fans of the “take that” genre who love messing with other player’s plans. If you’d like to become a backer, pledges start at $15 for the full game and stretch goals. Jail Break is scheduled to be in backers hands in October of 2016 and you have until Friday, June 3rd to become a backer. Head over today and check it out.